The Cooler Master HAF XB EVO takes the famous High Air Flow series to a revolutionary new form factor with extreme cooling performance. 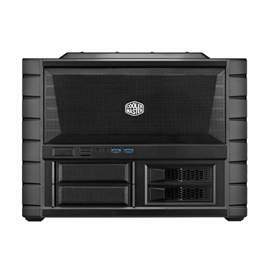 The removable horizontal motherboard tray and large mesh top and front panels with two 120mm XtraFlo front fans create a powerful front to back airflow. There is plenty of space for even the tallest high performance tower heatsinks, thick liquid cooling radiators and up to 3 of the high-end graphics cards.